Joss Residence, NJ: This project re-arranged a clumsy layout and cleaned up details to an existing loft conversion. Crude exposed ductwork, awkward sprinkler heads and messy lighting fixtures were all re-designed and concealed to clean up the overall appearance of the space. 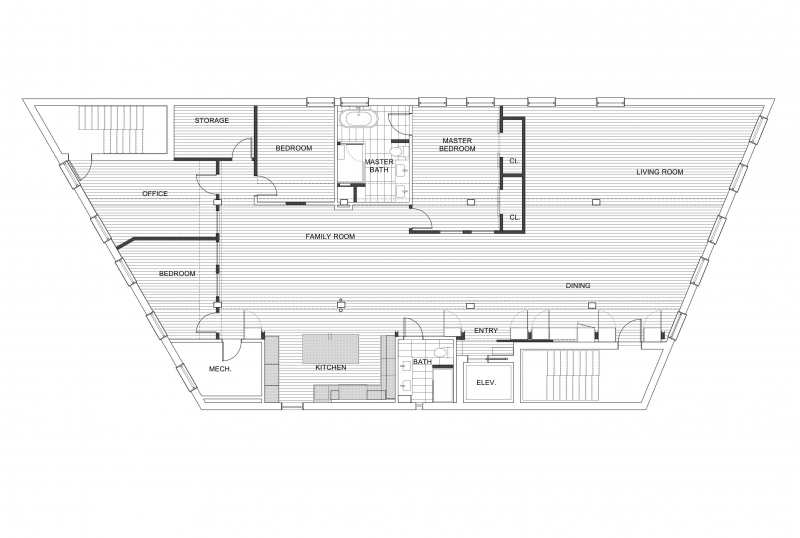 The re-designed space provided more bedrooms, an additional office space while actually increasing the square footage of the main living area creating a grander more open loft apartment. The other idea was to create a secondary colonade of metal channel pilasters to organize busy elements along the long wall of the space that includes, the kitchen, entry, public bathroom, mechanical room, fire exit doors and various storage cabinets and shelves. The design also utilizes many interior windows to bring daylight into the otherwise dark center of the loft and give occupants direct views to the outside from every corner of the place.